This installment of Port Road Trips is going to be a short one between it includes only the two intermediate signal locations between WAGO interlocking, discussed in the last installment, and SHOCKS interlocking located at the junction of the Enola Branch and Royalton Branch. 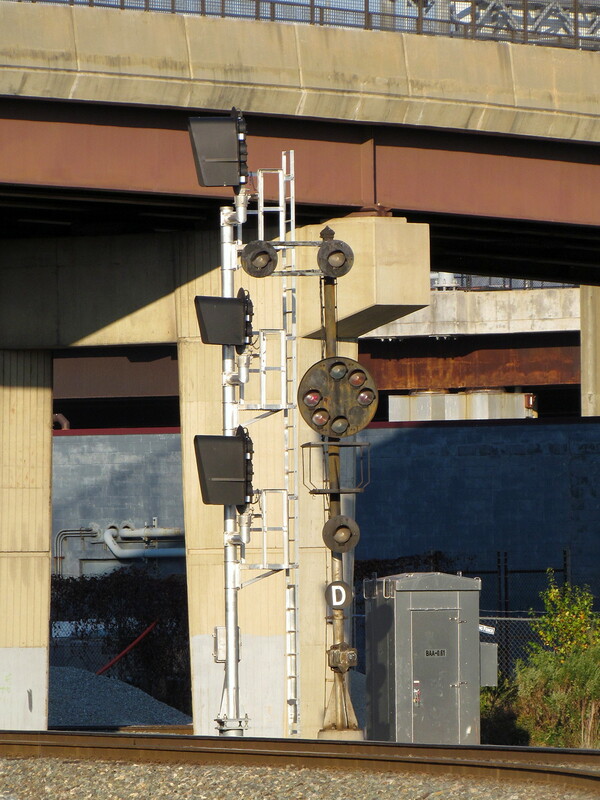 Unlike the automatic signals between WAGO and STELL which had been almost entirely replaced with NS type Darth Vader masts, the section between WAGO and SHOCKS exists as an island of PRR signaling with both locations getting a bit of a refresh when everything else was getting the color light treatment. I will be showing off the signals with two sets of photos. The first are part of the larger Port Road tour collected in 2004 by a friend of the blog and shows what things looked like before the catenary poles were removed. The second group of photos were taken just recently in 2013. Unlike the signals north of WAGO these were not recently renumbered by NS as they were never seen as part of the Northern Central milepost system and reflect the distance to Parkesburg, PA. The first of the two locations is the Milepost 45 automatics. 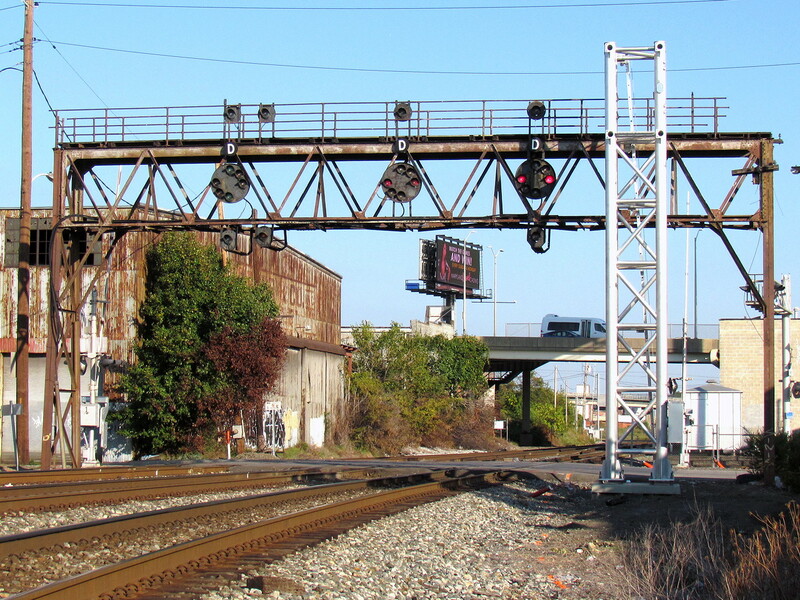 Here in this 2004 view you can see the typical layout PRR PL automatics where there is a single catenary mast. One signal is mast mounted to the cat pole in the typical electric territory style. The other signal is mounted on a standard PRR ABS mast. Back in 2004 this section of the line still played host to an out of service 138kV 25Hz power circuit and an active 6000V 100Hz signal power circuit. Note the old school mast base/relay case next to the larger PRR relay box with the attached block phone. The 495W ABS signal typically displays Approach for the Stop signal at WAGO, but back in 2004 it seemed that a train was en route as WAGO was pulled up enabling the 495W to display Clear. There is no lower head since WAGO does not provide for any non-Restricted speed diverging routes. Somewhat backlit view of the 496E automatic displaying Clear with the catenary poles stretching off into the distance. Getting to the MP 49 automatic did not require any sort of off road hiking as not only are they located adjacent to a small park road running along the Susquehanna River, but the Conrail C&S forces took the time to build this handy dandy little stairway up to them. Note the 6000V signal power supply. Each place the signal power was tapped the PRR provided a isolation switch in case there was some sort of line fault. Far above the PRR's 25Hz power supply is a modern day 3-phase 60Hz high voltage transmission line. When dealing with 80-year old technology sometimes it might not be practical to make alterations using the same methods great grandfather would have. After technology is allowed to match on for decades or centuries the need for changee may result in strange mashups or hybrids. 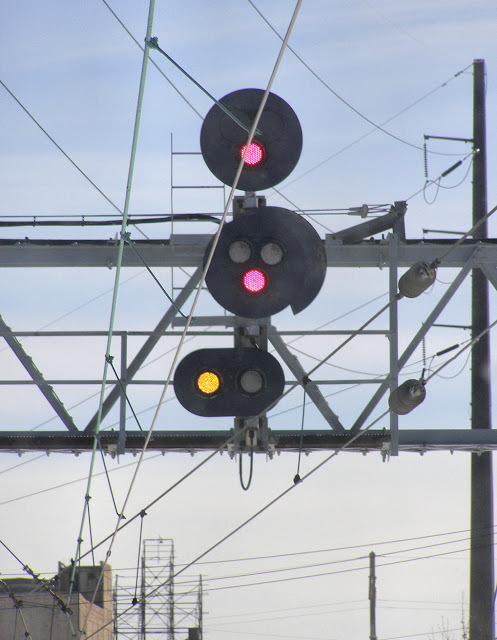 Thanks to its highly regulated nature railroad signaling is certainly no stranger to this phenomina where the best solution is often to touch as little as possible least you suddenly find yourself staring at millions of dollars in costs and extended downtime. Examples of this include use of LED lighting on mechanical semaphores or the remote servo-manipulation of mechanical levers, but today's example is a bit more audio-visual. Recently CHURCH AVE interlocking on the New York City Subway's Prospect Park Line was re-signaled resulting in the retirement of the resident US&S Model 14 interlocking machine that was installed by the IND Subway System way back in 1933. The NYC Subway is home to a good number of surviving US&S and GRS electri-mechanical power interlocking machines and even when they are replaced the NYCTA has stuck by the use of all relay logic because why fool with what works and you can fix in house. 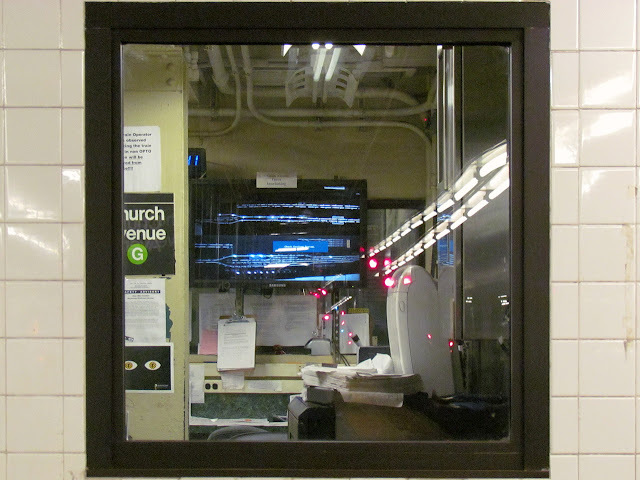 In addition to the operators in the tower, platform dispatchers need to maintain a view of the line in order to manage headways and make platform announcements. In some cases the tower and dispatch office are co-located. Other times they are not. In those cases the dispatcher is provided with a mimic model board giving the same view as the towermen.Well for whatever reason the dispatch office at the west end of the outbound platform was never fitted with such a model board. In the years before CHURCH AVE tower (located at the east end of the outbound platform) was replaced, the Transit Authority came up with this novel solution to avoid having to graft a new model board on to the 1933 electronics. Having trouble seeing what they did? Here is a closer look. They pointed a CCTV camera at the 1933 vintage model board and then piped that into a Samsung flat screen monitor in the dispatch office. What can I say, it is certainly effective even if it is a bit of a kludge. If you went back in time and asked one of the original signal engineers if they thought this casual use of television would be more or less likely than let say...flying cars, I wonder what their answer would be. I mean even if such a thing were technically possible how could it ever cost less than just stringing several thousand feet of wire. I mean aren't workers cheap? Of course I also got some video of the model board in action. If you are wondering why the model board doesn't seem to show all the trains properly it is because some of the track circuits (specifically those on the express tracks) have already been cut over. Anyway if you would like some more examples of technological mashups here are a few more from the Syrian Civil War courtesy of Forgotten Weapons. I believe I have mentioned this before but CSX is taking the "Baltimore" out of B&O CPL in its latest re-signaling project that will remove the last CPL signals from Baltimore City. These are located in the Bailey's Wye area and comprise CAMDEN, HB TOWER, BAILEY and LEADENTHALL ST interlockings. BAILEY is notable for its 3-track B&O CPL signal bridge and all of them were upgraded in the early 1990's in conjunction with the Camden Yards Sports Complex project. What a waste both in terms of hardware and cultural heritage. Yes, that signal on the left is displaying Medium Approach Slow. The cutover is scheduled for President's Weekend so if you haven't gotten your photos already this is your last chance. In other news BNSF dumping all the classic Northern Pacific searchlight signaling on the Cascades route between Seattle and Portland. This includes the popular cantilever masts in the Vancouver, WA area. Get your photos quickly. The Coast Starlight is probably the best option. 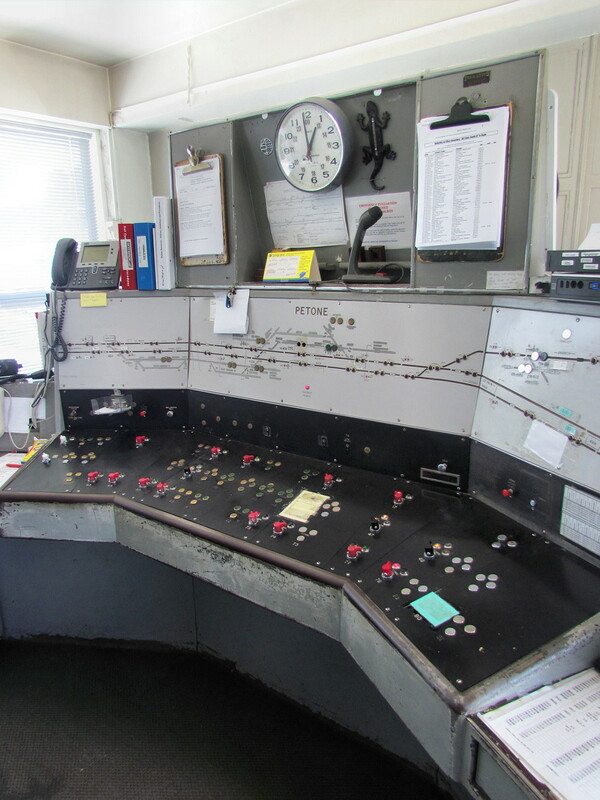 Finally, a friend of the blog in New Zealand went out and took some photos of the now closed Petone signalbox before it closed its doors for good. I have thus updated my short post about Petone with her work so thanks so much Sophisa. Signal aspect systems are a lot like languages. Many times they basically saying the same thing, but as you move around from place to place you might find those things spoken or pronounced in slightly different ways. In North America there is a fairly common language with single Green, Yellow and Red indicating Clear, Approach and Stop. 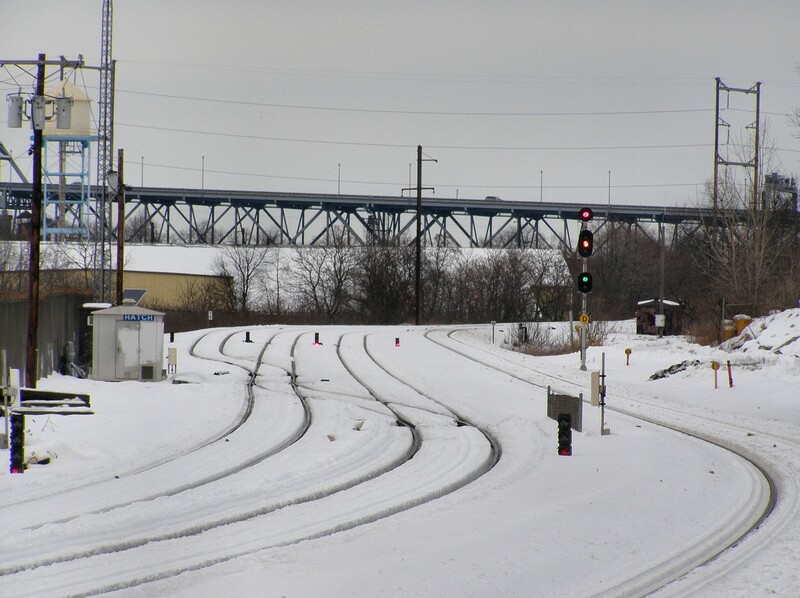 There are common concepts like approach the next signal at some speed, or proceed at some speed through turnouts or proceed prepared to stop within half vision. In the coming year I will be taking a close look a all of the major signal aspect systems, noting their various strengths, weaknesses, quirks and similarities, but I wanted to start out highlighting some of the common patterns that separate one system from another. This is one of the more common distinctions in the Eastern half of the United States. 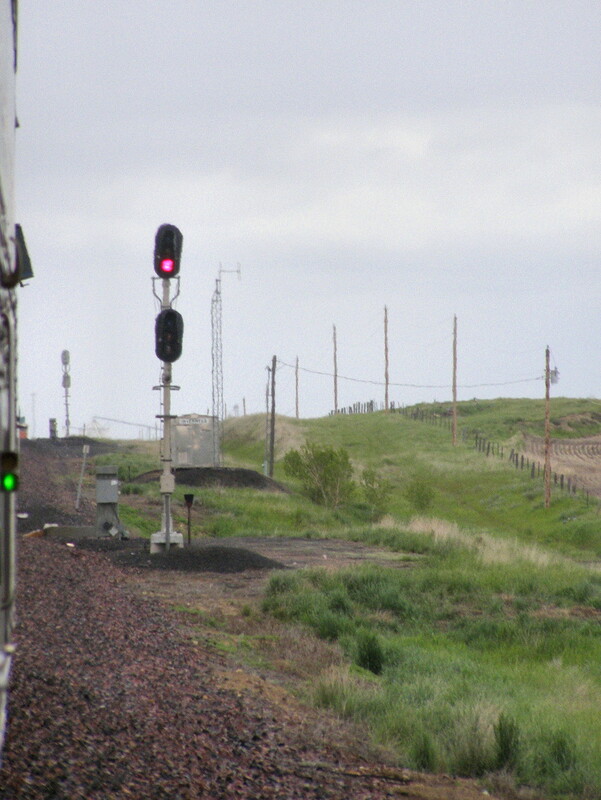 Advance Approach informs the engineer to be prepared to stop at the second signal. It is used in short block situations (ie less than 2 miles at normal speeds) where a 3-block system using only Approach would not provide sufficient stopping distance. I'm sure I could look up the real history of how this dichotomy developed between using Y/Y and Flashing Yellow for Advance Approach, but I'm just going to turn this into a story between the New York Central, which was a Y/Y road and the PRR, which ultimately became a *Y* road, or at least its successors did. You really needed a second head for that? This ain't semaphores. The story wasn't originally between Y/Y and *Y* because flashing indications did not become popular until the 1950's. The real story is that Speed Signaled railroads always had the option to overload the Approach Medium indication for 4-block signaling. Instead of allowing the engineer the discretion to stop by the second signal the speed signaling method would enforce a 30mph restriction at the first signal. The Y/Y method, on the other hand, informed the engineer of congestion instead of making him guess if the problem was a diverging movement OR congestion (one reason that route signaled roads went for Y/Y if it was free). 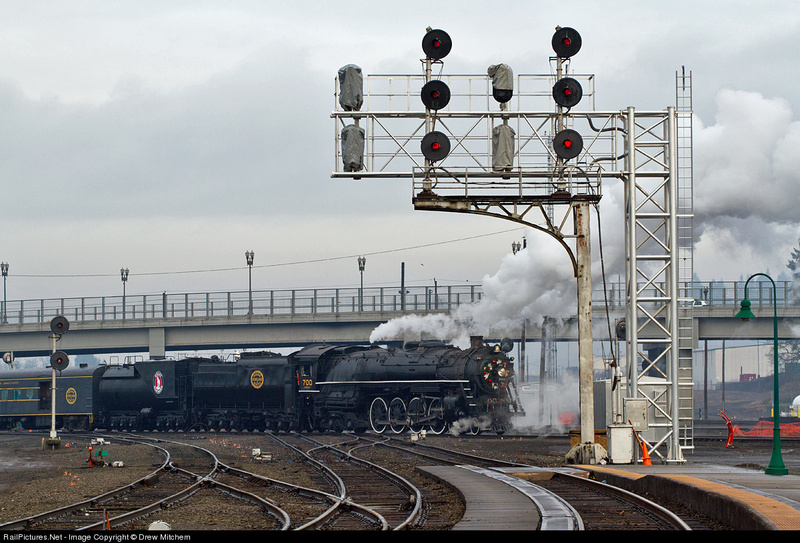 When flashing indications became available all the roads that had never bothered to deal with 4-block signaling or had just overloaded their Approach Medium signals adopted *Y* because it was both free and allowed blocks to be shortened without having to modify the wayside signal units. Y/Y Advance Approach is one of those old-timey things that have somehow survived into the modern era. It was used back in the days of the semaphore by a few high density railroads that didn't want to overload Approach Medium and didn't want to constrain their engineers. Conrail had the oppurtunity to put it to bed with the formation of NORAC, but unfortunately CSX is a bit more hidebound and has been turning back the clock when re-signaling former Conrail territories. 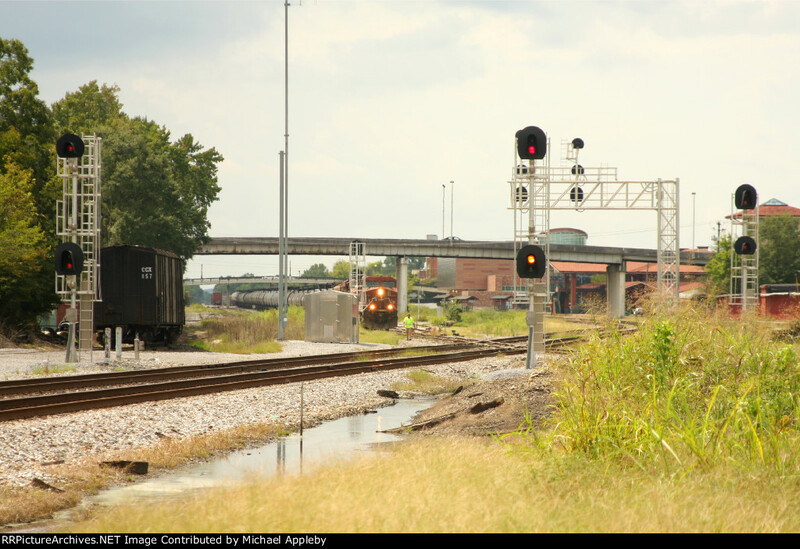 Y/Y vs Y/G Approach "Diverging"
Approach "Diverging' signals, either speed or route, are those that instruct the engineer to approach the next signal at a proscribed speed in order to safely take a diverging route. This is an interesting East vs West thing I don't really know where it came from, although I suspect lower quadrant semaphores had a role to play. The east almost universally uses Y/G to instruct engineers that they are about to diverge, while out West Y/Y is the standard. Canada beaks the tie with Y/G, but it still makes me wonder why the western roads wanted to be different. Like I said I suspect it has something to do with lower quadrant semaphores as Y./G is actually severely under utilized in the west, having only been recently resurrected for Approach Limited type indications. Route signaling, but Yellow over Green still means diverge. Here is a Speed Signaling special that certainly doesn't apply anywhere out west as all those guys use Y/Y for Approach Diverging. Another interesting point here is that sensible signal aspect systems like NORAC allow bot BOTH versions of Approach Slow, yet member railroads show distinct preferences for which they tend to adopt. Approach Slow is exactly what it says on the tin. Y/Y is an obvious choice because if Y/G is Approach Medium, downgrading the lower head to Y reduces the speed to Approach Slow. Of course Y/R/G is also an obvious choice since Y/G/R is Approach medium and moving the Green to the lower head downgrades it to slow. Y/R/G is the position theory version and Y/Y the color theory version. For roads that already adopted Y/Y for Advance Approach Y/R/G is what you are left with. Unfortunately this requires the use of so called "three headed monsters" and also precludes Approach Slow from being displayed on dwarfs. Whole lot of slashes going on. Looking back at NORAC which employs both methods it is interesting to see which member roads choose to use which signal. Conrail generally went with Y/Y once it standardized system wide in the 1990's. 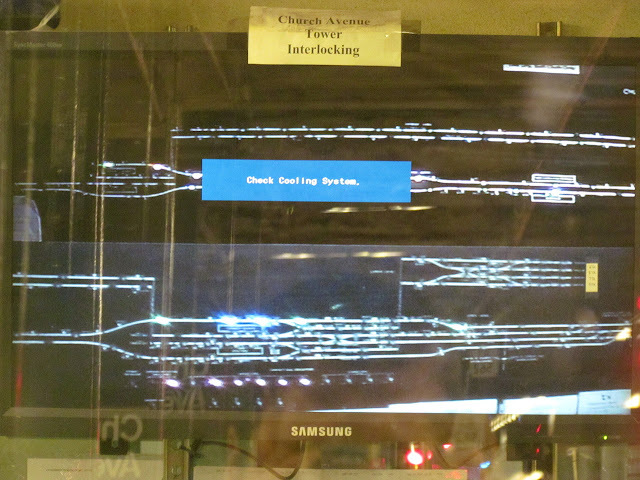 Amtrak has also been a big user of Y/Y. On the other hand NJT has made frequent use of Y/R/G as has SEPTA. Typically trains run on the model of prepare to diverge, diverge, proceed. 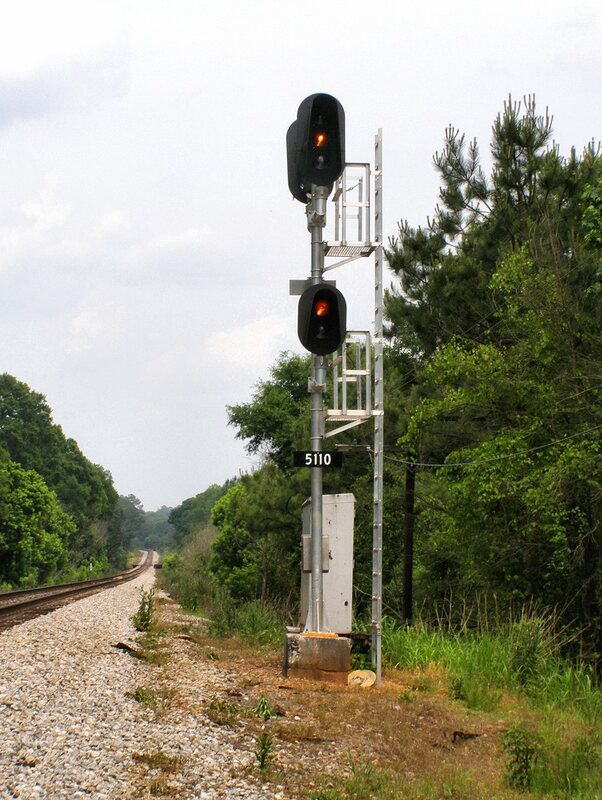 However when where finf a situation where one needs to diverge, then immediately diverge again you need a special "combination" signal that provides explicit speed/route instruction for the first action and then the next. 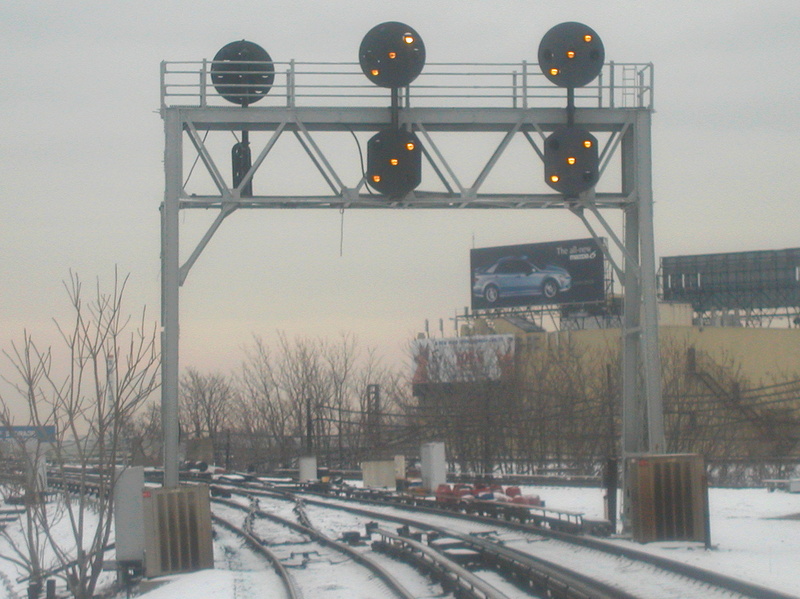 Now, the majority of railroads have tended to eschew these sorts of signals, either providing interlocking exit signals or allowing trains to diverge over a signal where the immediate action is implied from the preceding signal or over restricts the train for the next signal (think Medium Approach instead of Medium Approach Medium). I like to call this one "The Christmas Tree"
Anyway, one of the strangest splits in signaling practice is the use of R/Y/G for Medium Approach Medium vs Medium Approach Slow. With CSX and the former New York Central on board with the Medium Approach Slow it would seem that that is the standard, however it is somewhat baffling why those railroads would have so many situations where one encounters a medium speed route right before a slow speed route. Slow speed switches are actually pretty rare so why were those roads installing them enough to make Medium Approach Slow so necessary? Well the answer is that sidings would have single dwarf signals at their exit points. While the turnout might be Medium Speed, they would be signaled at Slow Speed, hence the need for Medium Approach Slow. In fact the New York Central didn't even have a Medium Clear dwarf indication. 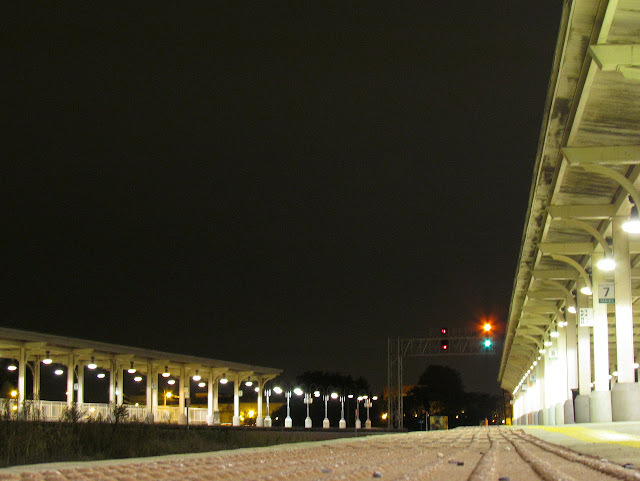 As time passed and better siding exit signals were provided Medium Approach Medium was created by using the flashing indication. When Conrail and the other Northeast roads created NORAC this anachronism was thrown out and R/Y/G was given over to the now more common Medium Approach Medium. In fact Conrail didn't even bother to adopt any Medium Approach Slow indication. Where sidings were equipped with slow speed exit signals they were upgraded to show Medium Clear using G/*R* from G/R Slow Clear. Again, the reversion of R/Y/G M-A-M to R/Y/*G* on former Conrail territory being changed to Seaboard signaling can be considered a step backwards on CSX's part. This is the same issue as above only as seen in route signaled systems. One would assume that R/Y/Y would be the default seeing as how Y/Y is the standard Approach Diverging indication. However R/Y/Y requires three heads and when one is upgrading a Restricted Speed siding into a signaled siding it would be nice to not have to modify the two headed searchlight with a lower head that can display Y, R or L. The easy solution for signal engineers in the 1950's with newly reliable flashing relays was to use R/Y for Diverging Approach and R/*Y* for Diverging Approach Diverging. One expects rare signal indications to require three heads. Approach Slow, Medium Approach Medium and the like aren't the sorts of signals one will see displayed every day. However quite a large number of railroads adopted systems that only allowed Medium Approach to be displayed on three headed masts. 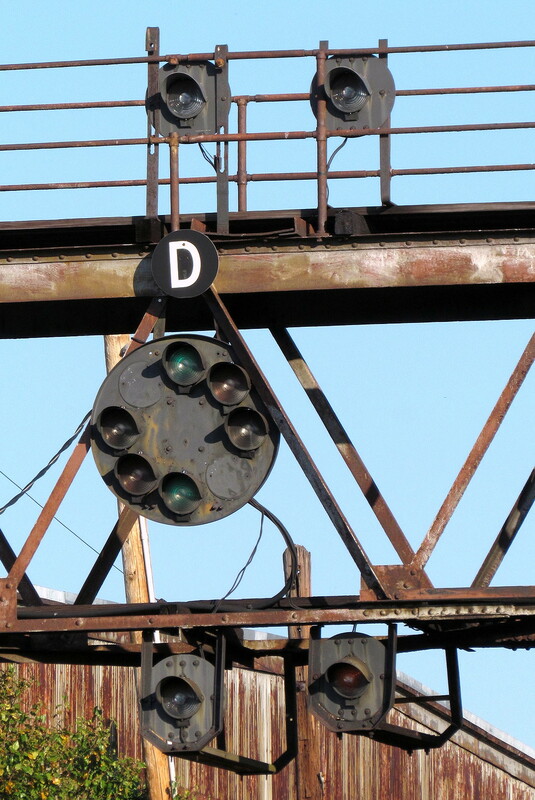 to be fair there was a time when almost all home signals were expected to have three places, if for no other reason than to allow for the use of a subsidiary semaphore in the bottom position to display R/R/Y Restricting, but quite a few railroads allowed this practice to persist well into the modern era. No flashing needed on three headed signals. The PRR had a unique situation wherein it completely lacked a Medium Approach, preferring trains to diverge over Approach, but adopted one in the 1950's when flashing relays became more available. This was carried over into Conrail and NORAC with the R/*Y* indication for use on two headed masts. Still, NORAC is the only system to adopt R/*Y* Medium Approach with others sticking with three headed masts or R/Y if that is not otherwise occupied by Restricting. Interestingly enough CSX uses R/Y/R in territories slated for conversion to Seaboard signaling in the future, but needing NORAC signaling in the present as it is common to both systems. For concept so common in North American signaling I don't know of anything else with more options to be expressed. From number plates to marker lights to flashing read and lunar white it seems that every railroad had a different way of telling trains to move slowly and not crash into stuff. One of the most interesting distinctions is between railroads that allow R/Y Restricting and Railroads that only allow R/R/Y Restricting. I term these two 'lower yellow Restricting" and "bottom yellow Restricting". R/R/Y restricting originally came about from very early interlocking technology where the Restricting indication would be controlled via its own lever or would utilize some different system to display since a Restricting was what one would pull up when the signal would not display normally. The early R/R/Y often involved a smaller semaphore flag or ground mounted semaphore called a subsidiary or call-on signal that would only be pulled up when the train was standing at the Stop. 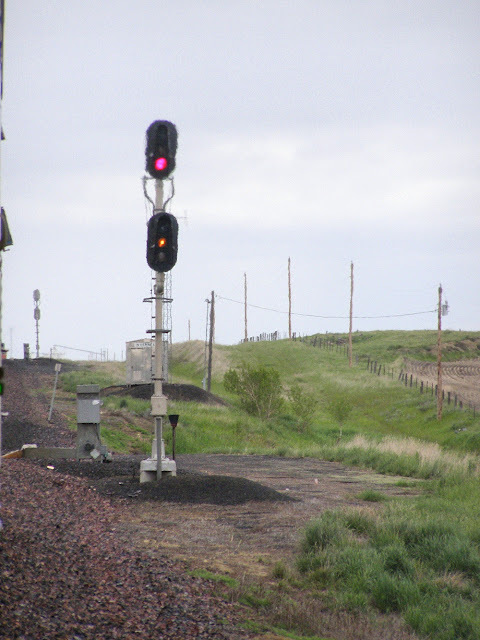 If the subsidiary signal was not needed at a particular location the railroad would have the choice of just providing a red marker or just assuming the crew could tell a main signal from a subsidiary signal and then allow R/Y to be used for something else. That oddly shaped lower head is the last vestige of the "subsidiary" signal. If the second head wasn't present you would have one main signal with one subsidiary far down on the post.This ultimately resulted in the bottom yellow form of Restricting where two headed signals need a gap between the heads to change a Diverging Approach into Restricting. 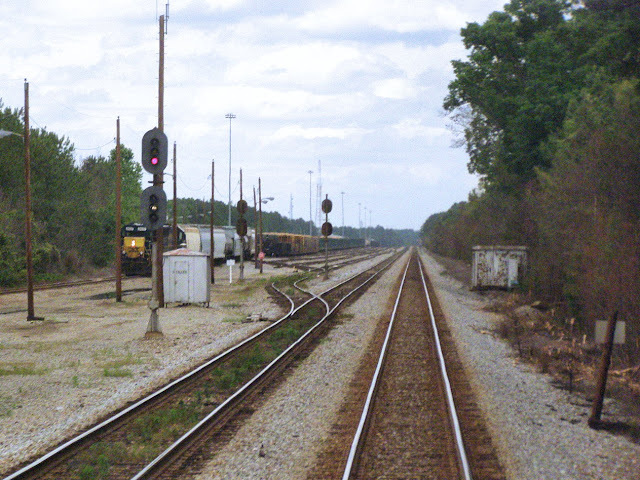 Railroad not using subsidiary signals or not using them exclusively would then have the choice of using R/Y for Restricting, but that would then limit Medium Approach to a signal with three heads (see above) or simply not employing that particular indication. Until NORAC and its option of R/*Y* this was the choice that railroads faced, two head Medium Approach and three head Restricting or three head Medium Approach and two head Restricting. The final piece of signaling dialect I plan to tackle today is the age old argument between making Restricting the old man out with a strange color or having to flash or by making something else the odd man out by giving Restricting a yellow slot on the lowest head. Incidentally all of the position light systems, ie the PRR, B&O and N&W, all count as being in the second camp as their forward slash would count as lunar in a color light system. This is of course clear on B&O and Amtrak where that slash is also colorized lunar. Thanks Seaboard Coast Line, you just had to be different. Not counting position lit systems non-yellow Restricting is most popular out west with Lunar being the previous standard that has now been supplanted with *R* as they avoids the need for second or third heads at absolute signals. The only exception is CSX whose Seaboard system made exclusive use of Lunar. 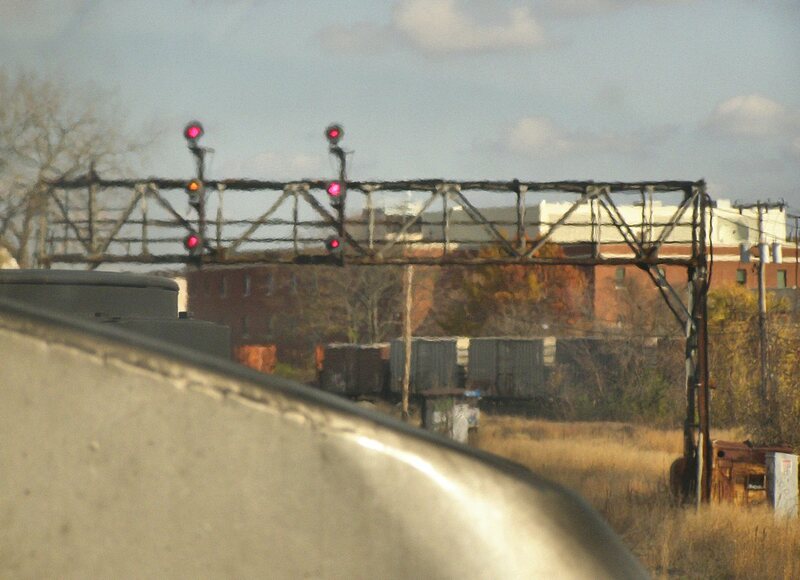 The Seaboard made use of Lunar very sparingly, usually only where trains would need to enter a yard, but with CSX's expanded use we are seeing quite a few 4-lamped signal heads. Again with all its recent re-signaling CSX seems to have passed up an opportunity to adopt *R* and eliminate yet another of its signaling kludges. Anyway, I could go on and on with this sort of thing, but these are the major ones and I will be referring to them as i explore the various signal indication systems used in North American in my upcoming series Better Know a Signaling System.